Griots, in contrast, are families of traveling musicians. The existence of Griots, and their roles in society, was first documented in writing in the fourteenth century, according to Thomas A. Hale, and Griots continue to operate within many contemporary communities on the African continent (250). Traditional Griot instruments include the kora, the balafon (or bala), and the nyanyer. Young Griots study these instruments by going to live with a teacher, such as an uncle. 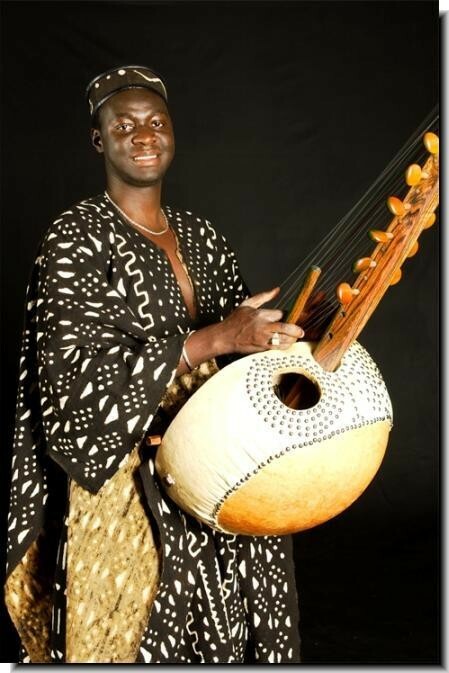 Gambia-born Mandinka Griot Foday Musa Suso describes the kora as a “sweet-sounding, twenty-one-stringed harp-lute” and states that it is the most difficult African instrument to play (50). The body of the kora is made from a calabash gourd and the skin is cowhide (Suso 58). The pole of the kora is made of hardwood, called keno, while fishing line is used for the strings (Suso 59). The oldest of the Griot instruments, the balafon resembles the xylophone. “The bala are hit with mallets that are made from hard wood. When you hit the key, the sound is amplified by the calabash gourd that lies beneath each note. The membranes, covering the tiny hole in each gourd, are usually made from cigarette papers. The papers give the gourds a buzzing timbre” (Suso 62). The last instrument Suso describes is the nyanyer. “The nyanyer is an instrument of the Fulani people, who migrated from Egypt and now live all over West Africa. It’s made of a small gourd that’s covered by iguana skin. The one-stringed horsetail nyanyer fiddle is played with a horsetail bow” (64). In Mali, Senegal, Guinea-Bissau and the Gambia, the Griot (or Jali) is an itinerant historian, musician and entertainer. For eight hundred years — since the beginning of the Malian Empire — Griots have preserved their region’s history and lore, passing them down orally through arduous apprenticeships, providing a cultural cohesion that endured both colonization and its aftermath (Preface 6). As Hale points out in his extensive study of Griot cultures, there is great cultural, linguist, and historical variety in how these traditions manifest themselves. For example, the functions performed by Griots and Griottes (female Griots) are numerous, and vary within different cultural contexts and communities. Often described simply as “praise-singers” because singing praises is the most obvious and audible function they perform, Griots and Griottes actually contribute to their own societies in so many other ways that “praise-singer” becomes a far too limited description. For example, they are also historians, genealogists, advisors, spokespersons, diplomats, interpreters, musicians, composers, poets, teachers, exhorters, town criers, reporters, and masters of or contributors to a variety of ceremonies (naming, initiation, weddings, installations of chiefs, and so on) (Hale 250-51). Griots have the power to name the past, as historians and genealogists for example, and to put the future in motion — even helping to determine what shape the future will take — in their roles as advisors, diplomats, and overseers of important rituals. Griots’ songs, then, both encompass and surpass the societal functions of Classical literature, including Greek literature’s focus on the praising of famous deeds. Hale, Thomas A. “From the Griot of Roots to the Roots of Griot: A New Look at the Origins of a Controversial African Term for Bard.” Oral Tradition 12.2 (1997): 249-278. Print. Nagy, Gregory. “Early Greek Views of Poets and Poetry.” Classical Criticism. Ed. George Kennedy. Cambridge University Press, 1989. Cambridge Histories Online. Cambridge University Press. 17 March 2011. “Preface.” Matthew Kopka and Iris Brooks, eds. Jali Kunda: Griots of West Africa and Beyond. Roslyn, NY: Ellipsis Arts, 1996. 6. Print. Suso, Foday Musa. “Jali Kunda: A Memoir.” Jali Kunda: Griots of West Africa and Beyond. Matthew Kopka and Iris Brooks, eds. Roslyn, NY: Ellipsis Arts, 1996. 17-72. Print.